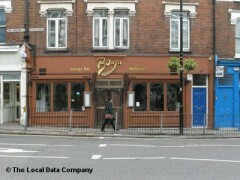 About: Bouga is known for its Award winning Moroccan inspired cuisine - delivering the Great Escape to the heart of crouch-end. The philosophy at Bouga’s is simple; Customers are served with Attention, Care and Heart. Food is fresh and Moorish. The Restaurant interior is unforgettable and entertainment is captivating. When you enter Bouga, you are in a romantic, mythical, secluded haven. Gamal is the Owner and designer of Bouga Restaurant. For the interior he has personally selected each piece of furniture and artefact in the restaurant. Some have been handcrafted and commissioned for Bouga whilst others have been carefully selected from independent sellers across Morocco. Various Silvers, Stones and ancient Berber jewellery adorn the restaurant. At the far back of the restaurant is our full open-view kitchen, where all the magic happens. You have to see it to believe it. Service was terrible, we waited half an hour for drinks. Waiters unfriendly. My friend's food was ok but my lamb was uneatable - tasted as though it'b been soaked in washing up liquid and had an odd smell. Did they care? No. Toilets smell and are next to scruffy kitchen. Music was too loud. Had to pay cash, they don't take cards. Over priced for what it is. I really can not recommend this to anyone when we have so many good restaurants in Crouch End. If these guys don't start sorting their act out they will be closed soon. Try putting the customer first! This restaurant is well worth trying. We hadn’t eaten Moroccan food before so were pleased our waiter was willing and able to guide us through their extensive menu. We decided upon the ‘grill feast’, a four course meal, which allowed us to try lots of dishes. It was a good choice and washed down well with a couple of bottles of Moroccan beer. The restaurant wasn’t busy, probably because it was early, but we didn’t feel intimidated as the restaurant has a really warm, cosy, intimate feel. I wish they sold the crockery they use and lamps – would look cool in my flat. I ate there today and was expecting something pleasant, they have inviting decor and I have eaten at many North African restaurants before so was hoping for an enjoyable experience. I ordered a vegetable tagine and some tea for a drink, with a cheese borak for a starter. The coffee took twenty minutes to arrive, the starter another fifteen after that and the tagine took half an nour despite asking the waitress numerous times, who seemed to have forgotten our order. When the food did come it was cold, bland and the vegetables were undercooked. The waiters struggled to English so I spoke to them in Arabic, even then they were rude and obtuse, they were unwilling to consider any of my criticisms or explain why it had taken over an hour to prepare my food and why the result was undercooked. In conclusion: terrible service, bland, undercooked food and waiters with limited English. Avoid at all costs. Quite impressive on the whole. Good service, very nice cosy atmosphere and setting. Everything tried had subtle but distinctive tastes, not too rich but far from plain. Nothing out of this world, but would definitely recommend for a quiet good quality meal. Partners food not cooked. Service leaves a lot to be desired.